Like any other database file, an SQLite database is also prone to corruption. There might be various reasons which cause SQLite database corruption. We’ll discuss them later here in this article. Also, we’ll learn how to diagnose that our SQLite database is corrupt or in an inaccessible state. And most importantly, we’ll find out how to repair SQLite database file and save our crucial data from being lost. Have you ever had a confrontation with a situation when you face any uncommon prospect during the execution of any transaction with SQLite database? Remember it’s one of the strong symptoms of corruption. SQLite is a popular relational database management system, although it’s not a client-server database engine. It’s a self-contained, high-reliability, embedded, full-featured, public-domain, SQL database engine. It’s the most widely deployed database engine in the world. Do you know why? Because SQLite is used by several widespread browsers, operating systems, embedded systems (such as mobile phones) and more other applications than you can count. If you’re looking for an open-source and embedded database software for local or client storage application software such as web browsers, SQLite best fits this need. Note: SQLite is a compact library which means the library size can be less than 500 KB even if all the features are enabled. The library size actually depends on the target platform and compiler optimization settings. SQLite database stores data in two formats: UTF-8 (ANSI) and UTF-16 (Unicode). There are two versions of SQLite database: SQLite2 and SQLite3. SQLite database uses a more general dynamic type system. In SQLite, the datatype of a value is associated with the value itself, not with its container. Each value stored in SQLite database has one of the following storage classes: NULL, INTEGER, REAL, TEXT, and BLOB. SQLite is a portable database resource. While SQL database needs to be running as a service. SQLite is one of many database systems that use SQL. While SQL is database query language. SQLite is embedded in Relational Database Management Systems written in ANSI-C. While SQL is used to query a database usually Relational Database Systems. SQLite is file-based. Whereas SQL Server and MySQL are server-based. Aforementioned are few common difference between SQL and SQLite. Running file descriptor: If you’re closing and reopening a file descriptor, again and again, this action may overwrite the threads managed on SQLite log files. This action may replace the data and you may face corruption. Restoration while a transaction is in running mode: If any backup job is running at the back-end of the system, this may create the backup of the SQLite database. As the transaction is not completed, the backup job will save some logs of the previous state and some logs of earlier transactions. And at the end, transactions ID doesn’t match and you face corruption issue. Deletion of a Hot journal: SQLite uses auxiliary journal files (by the same name of the database) for database recovery. If you rename, delete or move these journal files from the actual location, Server fails to find them. Hence, you can’t perform the automatic database recovery. Missing lock details: Some file systems are treated as reliable sources for locking SQLite database. They might have some unresolvable internal bugs which may cause missing lock details. Whenever the SQLite database gets locked and lock details are missing, it becomes highly prone to corruption. POSIX advisory lock cancellation: If you’re running SQLite database on UNIX systems, POSIX Advisory Lock facility becomes an essential task for default locking. The system call, Close(), often interrupts this locking action which may lead to SQLite thread corruption. Linking multiple copies of SQLite database is the key reason behind such corruption. Note: A system call is just what its name implies, a request for the operating system to do something on behalf of the user’s program. The contradiction of two different protocols: There are two protocols which handle SQLite database: SQLite3_vfs & SQLite3_open_v2(). In case you’re working on SQLite database with both these two protocols at the same time, you’ll face the contradiction. Numerous links to a file: If you’re linking up the SQLite database to multiple links with network connectivity, this may cause SQLite database corruption. Always avoid such inappropriate practice. Rename or unlink database: If you rename any file of SQLite database which is not present at the same location, this may cause unlinking in the SQLite database and may result in corruption. The sync command in SQLite database performs true synchronization, that’s it. But if it plays the role of I/O barrier instead of that, you may come across to any failure that can roll back the actions further. This may result in a violation of ACID (Atomicity, Consistency, Isolation, Durability) property, and hence the SQLite database goes into the resistant mode. If any type of failure takes place in storage media device, be it system hard disk or flash memory, this may cause SQLite database corruption. Sometimes unwanted changes in the content of storage media may cause severe issues for SQLite users. Make sure the disk has enough storage space so that you can write more data on it. But if there’s no space for data storage and you’re trying to write something into it, this may result in SQLite database corruption. 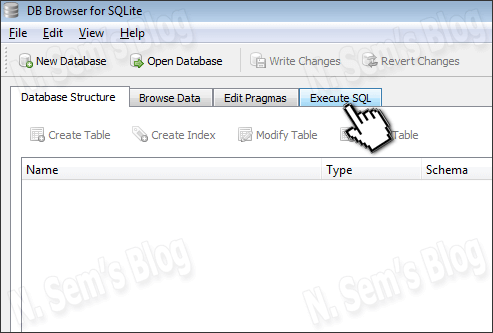 How to Repair SQLite Database? Prevention is always better than cure. We all know that corruption is an inevitable occurrence, and SQLite database is not immune to corruption. We should always ready with a valid backup so that we can restore the SQLite database from it. In order to take backup of the SQLite database, you can simply use Windows NT-Backup utility. 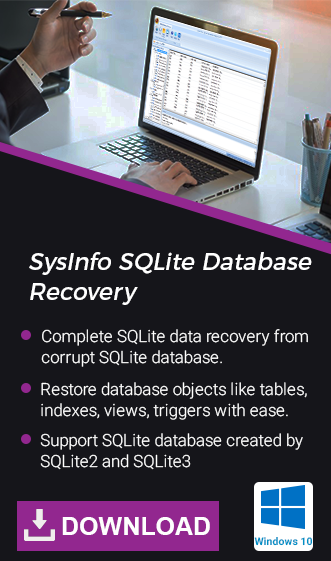 Unfortunately, if you don’t have a backup, you must repair SQLite database file. Step 1: Launch the DB Browser for SQLite on your system. 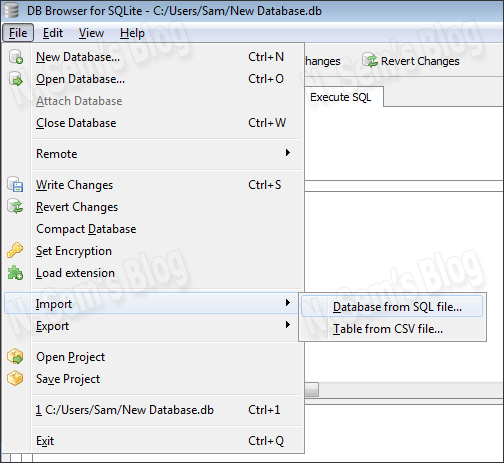 Now click Execute SQL tab to run database check command. Step 2: Type PRAGMA integrity_check and click the play button (shown in below image). My SQLite database file is okay, i.e. not corrupt. 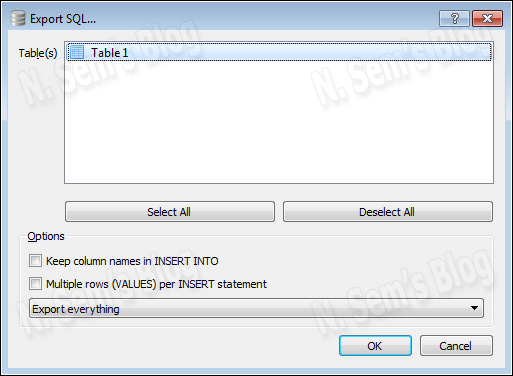 Step 3: If you find any error in the database, then you should export the database into a SQL file. Step 4: On Export SQL… dialog box, select the objects you want to export. Also, define other options as well. Finally, click OK to start exporting the database. 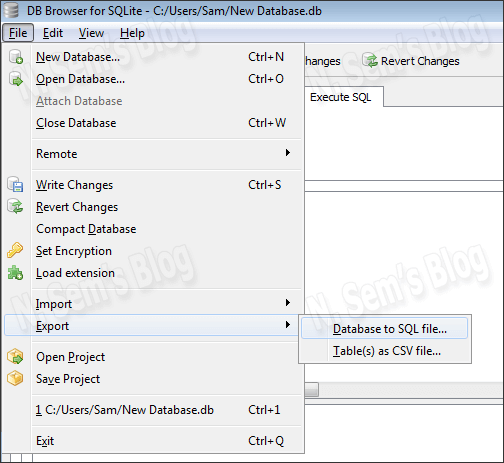 Step 5: Now you need to import the database back to SQLite browser. 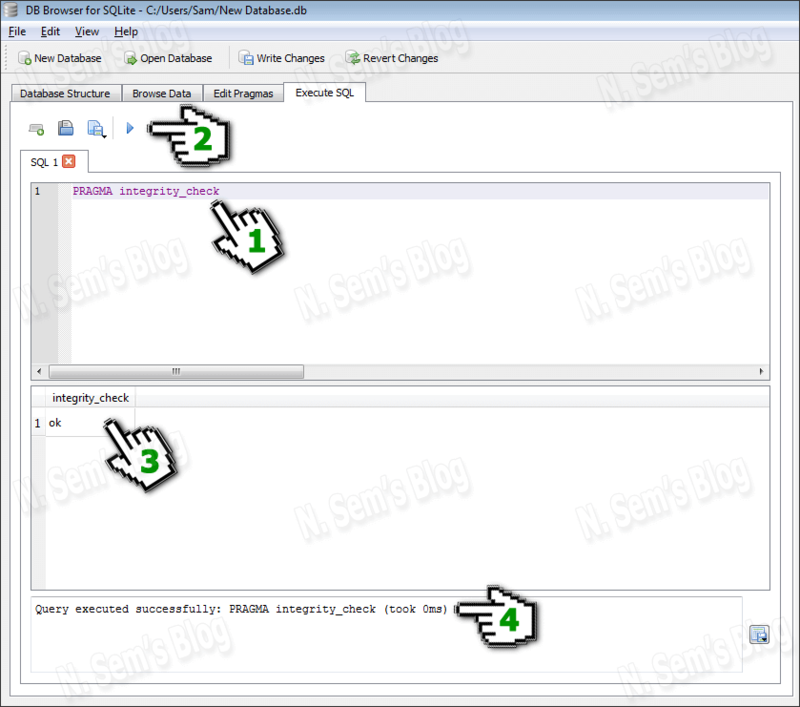 This action will repair SQLite database, and you can now open it with no problem. There’s one more manual way to repair SQLite database file. And most importantly, it’s an easy-to-use application that requires no prior technical expertise. No matter what type of user you are, i.e. technical or non-technical, you can use this software with ease. It contains an interactive and self-explanatory user interface.